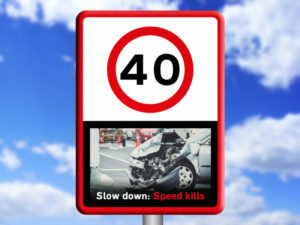 A campaign calling for UK speed limit signs to be accompanied by images of car crashes to deter drivers from speeding has launched with strong backing from drivers. Dubbed the ‘fag packet approach’, the move could make people instantly more aware of the risks associated with their actions. Research of 2,000 motorists carried out by insurance firm More Than found over half (58%) said the use of such signs could potentially have a real impact on their driving. The campaign arrives on the back of research from More Than to mark Road Safety Week (20-26 November), which found 62% of those surveyed admit they regularly ignore speed limit signs at present despite the introduction of new speeding fines in April this year, with 25% also contesting that the threat of going to speed awareness isn’t a big enough deterrent from causing them to speed on a regular basis. More Than is now exploring possible follow-up activity with a view to securing an actual pilot of the signs on UK roads to test how effective they potentially are, including approaching local police forces and pressure groups.